What sets video games apart from listening to recorded music and movies is the organic, three-dimensional experience – and no two gaming experiences are identical. Everything from the echo of the character’s footsteps in a hall to a grenade detonating off in the distance make the listening experience of video games unique and engaging. A resounding problem that we have encountered and continue to hear from our customers is that the default speakers in computers, TVs and cheap gaming headsets are not capable of capturing the wide range of ear tingling sounds that today’s game developers are spending time and money to deliver. Gaming soundtracks have become (and are continuing to become) a transformative part of the addictive gaming experience. We asked our biggest gamers at Klipsch HQ to outline three games that have the range, detail and quality of sound that are known to capture their audiences. If you know of others you like please let us know in the comments section. The sound quality of Mass Effect evolved with each game making it one of the best video game soundscapes ever. 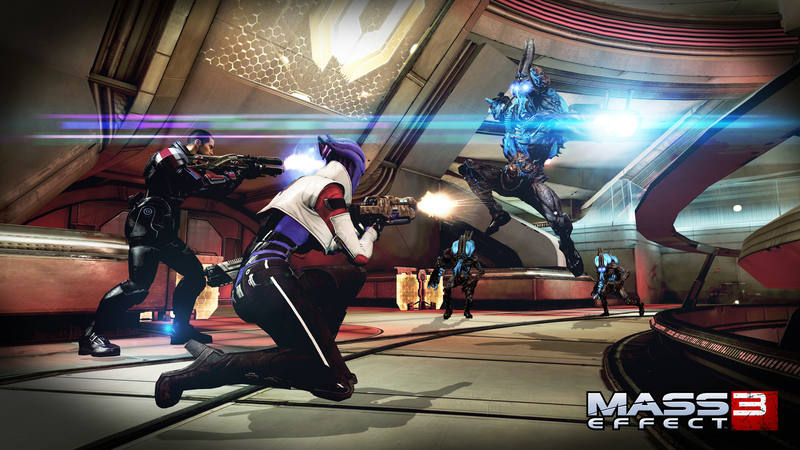 For most games, every single aspect plays an equal role in the game’s enjoyment factor. The sound quality of a video game is, in my opinion, the most important by far. Environmental sounds, weapon feedback, even nuances in voices can make or break a game experience. With that criteria in mind, I feel only one game series has far surpassed the status quo in every regard: Mass Effect. Mass Effect 1 (ME1) started the trend with unbelievable environmental effects: you can sense that you’re in an enormous open courtyard, clinging for life in a blizzard, on a spaceship hurling through space or that you’re on an uncharted world with minimal atmosphere, which normally would give you very little feedback. In ME1, they’ve been able to create the sound of…absence. However, ME2 and ME3 took a great thing and made it extraordinary. Both games use an updated sound engine compared to ME1, so the aural experience is now off the charts. The ambient effects in both games give every single “space” a distinct feel. Each alien race in the game, particularly English speaking ones, has a specific trait which only high resolution systems can reproduce. Said nuances quickly become indicative of that race’s signature demeanor. One in particular sounds very soft with a pleasant reverb so you associate them with kindness. Another has a low frequency metallic undertone so immediately you learn they are business first, kindness never. For the ultimate experience of what video game audio can be, the first chapter of the final mission of ME3 is your ticket. It’s worth playing through the entire series (yes, you read that right) just to see how far gaming has come. When I think about game audio that has had an impact on me, I tend to lean heavily toward the Final Fantasy series. While it is difficult to compare the overall game audio of the series to some of the more recent games we have seen, one element outshines even the most meticulously polished audio in any series: the music. Final Fantasy has long had a tradition of using its fantastic music to set the tone of the story. Even the magnitude of individual encounters will often be greatly enhanced by the background music used during battle. The first memory I have of a truly cinematic experience in a video game was in Final Fantasy VII. Not because of the three dimensional graphics that were new to the series, but because of the score. Going back and listening to the original game music, I can still feel the same energy and emotions that I encountered when first playing through the game. Even now when I play the most recent Final Fantasy MMO (FFXIV), I have moments where the music immediately triggers a change in mood. Where in one instant I was calmly traversing the world, the music generated by an encounter ensures that I am prepared to either fight or flee in the next instant. While some may view this as a fan being a fan, or perhaps simple nostalgia, a lot of the world seems to agree that it is not. Even disregarding critical praise, it is possible to find elements of the series influence in the physical world. Most gamers can instantly recognize the Final Fantasy “Victory Fanfare” (I also happen to use it as my ringtone). In a more surprising example, the 2004 Olympic Women’s Synchronized Duo Alison Bartosik and Anna Kozlova used music from Final Fantasy VIII for their routine (they won bronze). The name Final Fantasy was chosen for the first in the series because the studio making it feared that it may be their last game. A couple decades later it is rightfully still one of the biggest franchises in existence. I would like to think that this is due at least in part, to the impact of its music on the players. Bioshock's ability to give an immersive soundstage through it's environment and charters is top-notch. Of all the forms of entertainment available to the modern consumer, video games have a distinct advantage in one particular aspect: immersion. However, just because the gaming medium has this capability to immerse the player doesn’t mean all games excel at it. Occasionally you will find a series of games that have mastered this ability - and Bioshock is one of those series. Fully immersing a player in an artificial world demands perfection in all facets of video game design. The obvious elements are graphics, gameplay, storyline, level design and so on. However, the one aspect that is occasionally overlooked is audio. And interestingly enough, it is the audio that can make or break that coveted immersive feeling. Bioshock’s sound design has been carefully crafted so that you are never pulled out of the experience. There are two key elements of immersive sound that Bioshock does well and each has an underlying theme. First, the environment. The first two Bioshock games in the series are set in an underwater city - making for a difficult soundstage for the gaming developers to design. The creaking of buildings being strained by ocean currents, the dripping of water leaking in and somehow they even portrayed the immense weight of all that water above you in the eerie soundtracks and ambience. It’s not just cheesy water effects, it’s a well thought out sonic environment that never lets you forget you are underwater. And even though no such place exists, you believe that it does through the creative and accurate sounds. Bioshock Infinite (the third Bioshock game) takes place in a city floating up in the sky and the same theory applies - constant wind and strange, open echoes of gunshots and slamming doors. The game never lets you forget you are not on solid ground. Again, no such place exists, but for a few hours you believe it and that’s the power of immersion. Second, the characters. Many of Bioshock’s characters have magical powers and unrealistic feats of strength. And with a good sound design you believe that these creatures are real - and not only real but terrifying too. The best example is Big Daddy from the first Bioshock game. Even though this beast resembles nothing human, the essence that this creature once were human is hidden in the sounds it makes. It’s chilling but effective, drawing from what we can relate to. That’s not all, these enemies are extremely tough and the sound they make when moving and attacking is so haunting that you dread the moment you realize you have to fight one. So how does this make a difference? To me, with a detailed sound design, Bioshock has made the imaginary a reality because for the duration of the game you believe that an underwater city does exist, that these monsters are real and the world you are in is spiraling out of control. And that is successful immersion.